1 of 4 Coat a 5- to 6-quart slow-cooker bowl with nonstick cooking spray and arrange salmon in it, tucking the thin end of fillets underneath. Sprinkle ginger and garlic over salmon. 2 of 4 In a medium-size saucepan, bring broth, vinegar, sugar and soy sauce to a boil over high heat. Pour liquid around salmon, not over, and cook on HIGH for 1 hour or LOW for 2 hours. 3 of 4 Stir the bok choy stems into slow cooker for last 30 minutes of cooking time on HIGH or the last hour of cooking time on LOW. Add leaves to the slow cooker for final 10 minutes of cooking time on HIGH or final 30 minutes of cooking time on LOW. 4 of 4 Carefully remove salmon from slow cooker with a wide spatula; set aside and keep warm. Stir hoisin into liquid. 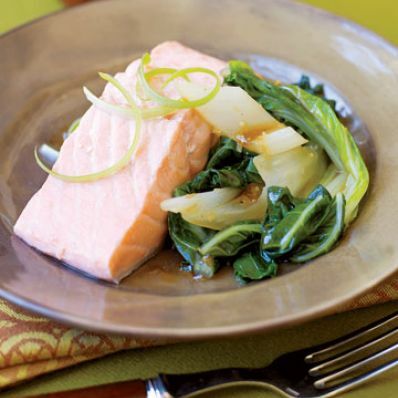 Sprinkle salmon with scallions and serve with bok choy and liquid. Per Serving: 2 g sat. fat, 94 mg chol., 515 mg sodium, 3 g fiber, 12 g Fat, total, 14 g carb., 38 g pro., 312 kcal cal.